The Columbia Basin pygmy rabbit is the smallest rabbit in North America. An adult pygmy rabbit weighing under a pound, can hop up to fifteen miles an hour. However, they rarely range more than 200 yards from their burrows. They do not hibernate and can withstand temperature from below zero to over 100 degrees Fahrenheit. The Pygmy rabbits have evolved a large liver that enables them to digest sagebrush found in dry deserts. The decline in the sagebrush deserts due to the growth of agriculture, cattle grazing and wild fires is a major reason for the reduction in their populations. Pygmy rabbit sub-species, with characteristics distinct from the Columbia River Basin pygmy rabbits, live in Idaho, Utah, and Nevada. Pygmy Rabbits breed from February to July, producing from one to three litters each year. For protection, the females bury their litters of kits in shallow burrows, returning once a day to dig them out, feed them, and cover them again. This practice stops after two weeks when the kits are ready to fend for themselves. In 2001, a Washington State survey found only thirty surviving Columbia Basin pygmy rabbits. Sixteen of those were taken into a captive breeding program. In 2004, pygmy rabbits were brought in from Idaho to broaden the genetic pool. 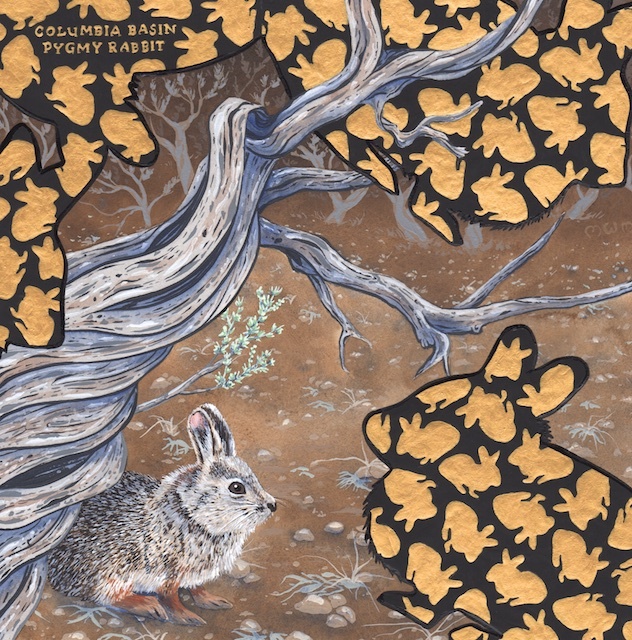 The last purebred Columbia Basin Pygmy Rabbit died in 2008. After failures in releasing captive animals into the wild, a ten-acre fenced reserve was established in 2011 and fifty rabbits were released in the enclosure resulting in the first kits being born into their natural habitat from captive-born animals. More sub-species of pygmy rabbits were brought in from Nevada, and Utah to strengthen the population. Even with concerted efforts of zoos, universities and wildlife organizations, the future of the pygmy rabbits in the Columbia Basin is uncertain. However, additional enclosures have been established in Washington and there is cautious optimism for the hybrid rabbit’s survival.